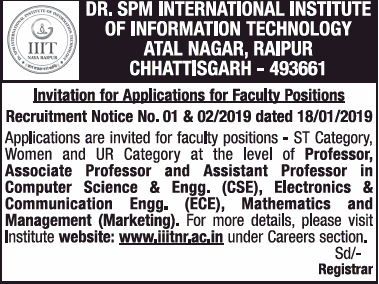 Dr.SPM International Institute of Information Technology, Raipur has advertised in THE TIMES OF INDIA newspaper for the recruitment of Teaching Faculty- Professor / Associate Professor / Assistant Professor jobs vacancies. Interested and eligible job aspirants are requested to apply on or before 10th February 2019. Check out further more details below. About College: Dr. SPM IIIT-Naya Raipur, established by the International Institute of Information Technology University Act, 2013 of the Government of Chhattisgarh, is a joint venture by Chhattisgarh State Government and National Thermal Power Corporation (NTPC). The institute is committed to pursue excellence in higher education, research and development in Information Technology (IT) and associated disciplines. It firmly believes in bestowing knowledge dissemination and imparting entrepreneurial skills to the students to enable them to address real world problems. To empower this vision, IIIT-NR fosters state-of-the-art research and product development laboratories to carry out inter-disciplinary research and product development endeavours. Qualifications: Ph.D with 3 to 10 years experience. More details can be had from the official website link. See the advt copy in the attachment here below in reference.